The Bluefaced Leicester is an English Longwool type sheep. They were founded by Robert Bakewell's, Dishley Leicester**. Mr. Bakewell picked top quality Border Leicesters, that showed 'blue' faces and finer fleeces. Although the hair on the face is white the underlying skin is dark blue. The BFL is also known as the Hexham Leicester due to being found around Hexham in the northern English county, Northumberland. They have also been known as the Bluefaced Maine and the Blue-headed Maine. The Bluefaced Leicester is popular as a crossing sire throughout the British Isles. Some of the most common crossings are with the native British hill breeds such as the Swaledale, Welsh Mountain, Cheviot and Blackface. The offspring from theses crosses are known as a 'mule'***. To this day, 46% of Britain's crossbred ewe population is now made up of mule ewes. They are commonly bred in their first year and will produce lambs for up to 6 years or more. The mule is one of the finest commercial breeding ewes available. The Bluefaced Leicester's have a broad muzzle, roman nose and a good mouth. Their eyes are alert & bright and their long ears stand erect. Their well known dark blue skin can be visible through the white hair on their head on the traditional white. They also have a small amount of brown that can show up. The neck is a good length, with broad shoulders and ribs that are well sprung. The back is long and strong that leads up to their broad and deep hindquarters. The Blue's stand square and thick on strongly boned legs. The wool is tightly purled and fine. The average fleece weight is 2-4.5 pounds with a staple length of 3-6 inches. Mature rams weigh around 250 pounds and ewes 175 pounds. Pure Bred BFL's may obtain a lambing rate of 200-250%. This genetic of fertility is passed onto the mule ewes, here, they can easily obtain lambing rates over 200%. Using the Bluefaced Leicester as a sire, they can produce length and good fiber in the crossbred lambs. They are vigorous at birth and have a well made fleece already which helps them withstand colder climates easily. The lambs that are kept as breeding ewes carry multiply embryos with ease. While the withers can be sold at a wide range of acceptable carcass weights. In 1963, the Bluefaced Leicester Sheep Breeders Association was formed along with creating a flock book. Its aim was to encourage the breeding of the Bluefaced Leicester, as well as maintaining its purity. In the early years of 1970's the Bluefaced Leicester was imported to Canada and shortly after that, they made their way down south into the United States. A flock of Bluefaced Leicesters is being researched on to better understand and develop the breed at the Institute of Rural Studies in Aberystwyth, Wales. There is also Crossbred Ewe Project in the United Kingdom that is government funded and is investigating the future development of the crossbred ewe. 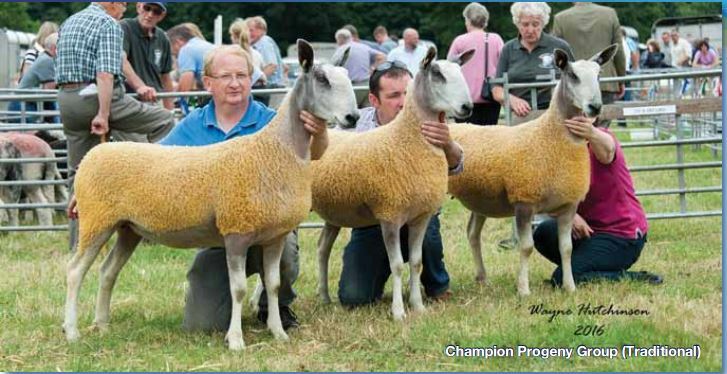 There is many phenomenal reasons why the Bluefaced Leicester is one of the leading maternal crossing sire in the United Kingdom. Almost half the commercial ewes in the UK are sired by the Bluefaced Leicester. In 2001 it was estimated that 63% of the commercial lamb production in the UK was from the "mule" ewes. But why use a Bluefaced Leicester ram? The Bluefaced Leicester ram has been selectively bred for his ability to pass on the breeds quality and amount of milk, prolificacy, extra length of loin and fleece characteristics to its offspring. When crossed with any one of the hardy hill breeds, the lambs inherit the maternal characteristics, longevity, easy care and hardiness of the hill ewe along with the traits of the BFL. This crossing results in a hybrid with the strengths of each breed. The mule ewe truly is a great commercial ewe that will usually produce a 200% lamb crop with less input than any other commercial ewe on the market.